You can conveniently fit eye care visits into your schedule. Check out our fantastic variety of new glasses frames and sunglasses. Brands include Nike, Ray Ban, Michael Kors, Emporio Armani, and more. And we are now an in-network provider for Davis Vision, and the only Davis provider located on central campus! * Closed for lunch noon - 1 PM. Hours may vary during semester breaks and holidays. What happens during a routine vision exam? What visual aids are available at UHS? How can I get a prescription for eyewear filled? How can I visit the Eye Care Clinic and Optical Shop? What fees and insurance apply? In the Eye Care Clinic, optometrists perform routine vision exams, dispense contact lenses and detect eye disease. These doctors of optometry specialize in examination, diagnosis and treatment of impairment and disease of the visual system. Treatment may include prescription of medicine, glasses, contact lenses, other optical aids or vision therapy. 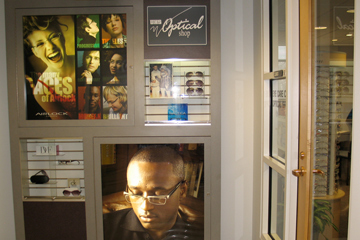 The Optical Shop maintains a large and complete selection of frames. In addition, a complete line of sunglasses, reading glasses, sports, recreational and protective eyewear is available at competitive prices. A routine vision exam begins with a complete health history. Allergies, chronic diseases (e.g. diabetes), prescription and non-prescription drugs and health conditions such as high blood pressure can all affect vision. The optometrist will check the interior and exterior eye as well as the surrounding area for defects and disease, and assess the ability to see clearly at near and far distances, eye coordination, color vision, depth perception, refractive error and field of vision. Based on the results of this examination, the optometrist may prescribe medication, corrective lenses (glasses or contact lenses) or vision therapy as needed. We recommend that you bring sunglasses to wear after your exam because your eyes may be sensitive to sun after dilation. We do provide disposable sunglasses for your use if you forget yours. Most people can drive after a visual exam. However, if you are farsighted you may have visual impairment and would have to wait a few hours to drive. For this reason, you may wish to make transportation arrangements before your exam. Routine vision examinations are an important part of preventive care. Anyone with a history of vision problems should get routine vision exams. If you experience squinting, blinking, rubbing eyes frequently, headaches, changes in vision or difficulty with visual concentration within arm's length, get an vision exam, because these may be signs of eye problems. People who wear contact lenses should get an exam annually. People in their mid-twenties to mid-thirties who do not wear contact lenses should get an exam every two years. People in their mid-thirties and older should get an exam annually, because changes in vision and focus, along with eye diseases, are more likely to develop. Contact lenses have certain advantages over glasses. They allow a natural field of view since there are no frames to block side vision. Also, they move with the eye so that the wearer usually looks through the center of the lens where vision is the best. The keys to successful contact lens use are personal motivation, proper fit, proper lenses and continuous professional care. Whatever type of lens you wear, talk with your eye doctor about proper care and wear, which are critical to maintaining the quality of your eye health and vision. Although lenses are available for overnight wear, UHS eye doctors strongly discourage wearing them overnight because of the dramatic increase in eye diseases related to extended-wear contacts. Also, if you will live in an isolated area for any length of time, make sure that there is a facility at which either RPG or soft lenses can be checked or replaced as needed. See also For Contact Lens Wearers: How to Care for Your Eyes When You Travel. Sport and recreational glasses promote safety and comfort for a variety of sports. Sunglasses help the eyes adapt to bright conditions. They should be worn to eliminate tearing, squinting and blinking, or to protect eyes during prolonged exposure to the sun. Sunglasses should not be worn at night (particularly when driving) because they reduce the amount of light entering the eyes and therefore decrease visual ability. Occupational safety glasses protect the eyes from chemicals or other particles. They may be required for laboratory work or for work with some machinery. Vision training refers to the use of exercises as a means of improving conditions that cannot be adequately treated with eye glasses or contact lenses alone (e.g. poor eye coordination/movement/focus, crossed eyes and lazy eyes). Training may include use of lenses, prisms, filters and activities designed to improve visual skills. These techniques may alleviate symptoms such as headaches around the eyes or back of neck, difficulty reading and sleepiness when doing close work. How can I get a prescription for eye wear filled? If you have a contact lens prescription from outside UHS that is less than one year old, we can fill your prescription. However we do not accept contact prescriptions from outside the US. If you do not have a contact lens prescription that is less than one year old, you must first receive a complete vision exam through the Eye Care Clinic to ensure that the contact lenses fit correctly and there are no other eye problems or conditions that warrant further attention. For easy replacement of lenses and for consistency of care, we recommend that contact lens wearers establish a relationship with one of the optometrists. You must be a patient of the UHS Eye Care Clinic. Your contact lens prescription must have been written within the last year. Prescriptions for regular glasses, sports and occupational eye wear are generally ready in a week, although special orders may take longer. You may fill your home doctor's prescription for glasses at the UHS Optical Shop. No appointment is needed. Call 734-764-8320 or stop by Appointment Scheduling (2nd floor). Medical conditions such as conjunctivitis, acute visual disturbances, foreign bodies or injuries to the eye are considered urgent concerns, so please contact us right away. See Schedule an Appointment or Nurse Advice by Phone. The Optical Shop is open Monday through Friday 8 AM - 4:30 PM (except noon-1 PM) for walk-in visits. No appointment is needed for Optical Shop. Routine vision exams are NOT covered by the health service fee, so students pay additional fees. Insurance may apply. Costs and insurance are described below. Eye care for medical conditions (e.g. conjunctivitis, acute visual disturbances, foreign bodies or injuries to the eye) IS covered by the health service fee, so currently enrolled U-M students pay no additional fees. Cost of contact lens prescription and fitting (in addition to cost of the routine vision exam above, and does not include actual contact lenses) depends on complexity of the lenses. These fees range from $58 to $120. Insurance pays 100% of cost of routine vision exam and charges for an eye exam performed for the sole purpose of the fitting of contact lenses, plus 100% of cost of glasses including frames and lenses, or contact lenses. No annual deductible needs to be reached for coverage to begin. Patient pays no copayment or coinsurance. Insurance pays 70% of cost of routine vision exam and charges for an eye exam performed for the sole purpose of the fitting of contact lenses. No annual deductible needs to be reached for coverage to begin. Patient pays a $20 visit co-payment plus 30% co-insurance. Insurance does NOT pay for glasses (frames, lenses) or contact lenses. Insurance pays 100% of cost of a routine vision exam and charges for an eye exam performed for the sole purpose of the fitting of contact lenses, plus 100% of cost of glasses including frames and lenses, or contact lenses. No annual deductible needs to be reached for coverage to begin. Patient pays a $20 visit co-payment, then insurance pays 100% of rest of cost of the routine vision exam and and charges for an eye exam performed for the sole purpose of the fitting of contact lenses. Premier Care and GradCare (Blue Care Network) members: UHS is a Network 1 provider. Insurance will pay for one routine vision exam per policy year. UHS can bill U-M insurances and Blue Cross/Blue Shield of Michigan. UHS is a Davis Vision provider. For more on Davis Vision benefits, see the Benefits Office website.